As the fields of resilience and positive psychology grow, there is increased focus on understanding the resources that facilitate wellbeing and positive development rather than factors preventing negative outcomes. As these developments occur, there is an increasing need for measures validated on high risk and marginalised populations of youth that assess the resources that potentiate wellbeing. 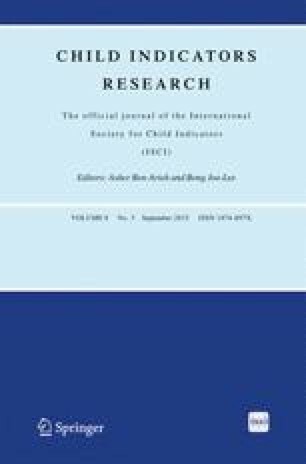 Using data from a cross-sectional study of 1,477 youth (12-to-17 years old) in New Zealand, who were in either high risk or low risk environments, this paper presents the validation of questions developed by Hektner (Journal of Research in Rural Education, 11, 3–14, 1995) as a scale for use with youth, assessing their feelings about their own futures. A bi-dimensional construct composed of positive (three items) and negative (four items) emotions has been identified and confirmed through the use of exploratory factor analysis and confirmatory factor analysis that also tested factorial invariance across the two groups. Inter-item correlations ranged from 0.357 to 0.517 (negative emotions) and 0.295 to 0.455 (positive emotions). The two sub-scales show good internal reliability. Convergent and divergent validity testing of the measure is assessed using scales of risk (conduct problems and risk of depression), resilience, and satisfaction with life. Patterns in the responses of youth across the two groups are also compared. The authors thank the Ministry of Business, Innovation and Employmentfor funding this research programme. They also gratefully thank all the young people and their supporters who participated in the research. Finally, they acknowledge the contribution of The Donald Beasley Institute, The Research Trust of Victoria University and its staff, Youthline NZ and Kapiti Youth Support and all the other researchers who helped with the research. Hurrelmann, K., & Quenzel, G. (2013). Lost in transition: status insecurity and inconsistency as hallmarks of modern adolescence. International Journal of Adolescence and Youth, 1–10. doi: 10.1080/02673843.2013.785440.